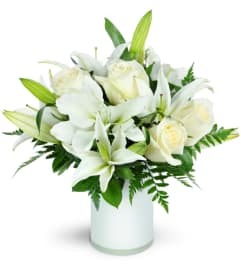 Blanket your holiday table in elegance with this lush white floral Holiday Centerpiece. 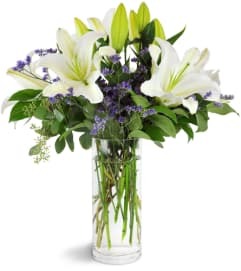 Beautiful white hydrangeas and lilies form a snow-white cloud beneath three slender silver candles. 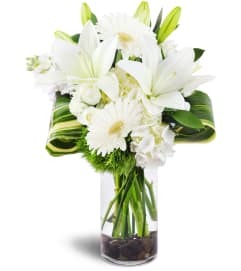 White flowers, including hydrangeas, Asiatic lilies, and carnations - are combined with deep green salal, variegated pittosporum and silver leaves beneath three silver taper candles.